I've been formatting ebooks since January 2012 when I took the plunge into self-publishing and have recently started offering ebook formatting services. It seems like every time I format a book I learn something new, but the most recent thing I learned was it's all about Styles, Word Document Styles (2007 and 2010). Using Styles instead of the Enter key to create line spaces makes a pretty flawless ebook, whether you're creating an epub, mobi, or uploading a Smashwords .doc. So I thought I would share today how to create Styles for yourself. 1. On the Home Tab, find the section on the ribbon where it says "Styles." 2. The sections of the Styles, you see the Quick Styles. 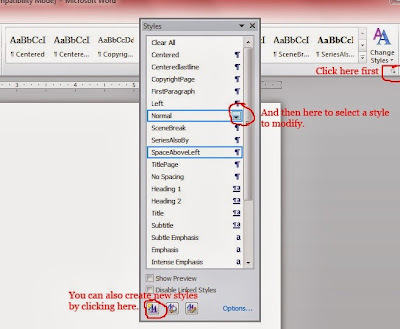 Most Word documents have some Styles already created such as Normal, Heading 1, Heading 2, etc. 3. You can modify these styles for your document. First click the little box with the arrow at the lower right corner of the Styles section. Then select which Style you want to modify by clicking the drop-down arrow. A box will pop up, and you'll click "modify." You can also create a new Style by clicking the first box on the lower left of the pop up. 4. Another box will pop up when you modify or create a Style. Name your Style. I typically pick something I'll remember what it does, such as "Title Page," "Center," "First line paragraph," etc. You can select your Style type, or a Style it is based on. Then, you select your font, font size, justification (left, center, right, justified), line spacing, etc. You can also click the "Format" button to change Font, Paragraph, etc. You can also select if the Style is only for this document or all other documents based on this template. 5. When you're finished, click "OK" to save your style. What I've done recently is create an Ebook Template where I have all my Styles and then I save it as a Word Template. That way when I'm ready to format or start a new book, I can open the template, save it as a new document, and use the Styles I have saved to format the ebook. A good way to learn more about Styles is to click on the ones already in your Quick Styles and see how they are created and what modifying does to your text. Since you offer formatting, have you seen the services page on the IWSG site? Cherie, it's still like Greek to me, and that's why I'll be hiring YOU next time! I'm in the midst of book formatting hell as I'm formatting my poetry book to come out in ebook form. In my case I have to try to do it with Open Office. It's extra tough with poetry and I'm losing some of the interesting visual things I did in the print edition. But I hope to get the thing done before too long and then all I have to do is learn to design a book cover. Ouch! That sounded like a nasty fall. At least it sounds like nothing broke (or you just didn't mention it.) Get well quick. Thank you for these awesome tips! Oh and I'm sorry for your fall. I hope you are okay though, and recovering nicely. Formatting is something that needs so much patience but is a skill worth learning. Good for you for offering your services. Thank you for sharing these great tips, Cherie! Also, I'm sorry to hear you're still in pain from the fall. Feel better soon! Head=spinning. This is when I count my blessings for being married to a techie who takes on these kinds of headaches. I mean, they're doable, but partnerships make things so much easier. Oh no! I remember you mentioning that fall on Facebook ... That must have been REALLY painful. I hope you manage to heal fully soon. *sigh* Formatting ... Already done 3 books this week and have another one lined up tomorrow! I'm going to start dreaming in HTML soon! I saw your comment at EJ's site. I'm too cheap, too. Maybe we both need to charge more for formatting? Now that I understand styles it makes my life so much easier. And within series I just copy the styles from one doc to the new one! Glad you're recovering from that fall. I was so glad the day I started paying attention to how styles make formatting easier. Once I had a handle on it, formatting was that much easier. Hope you're healing up quick. 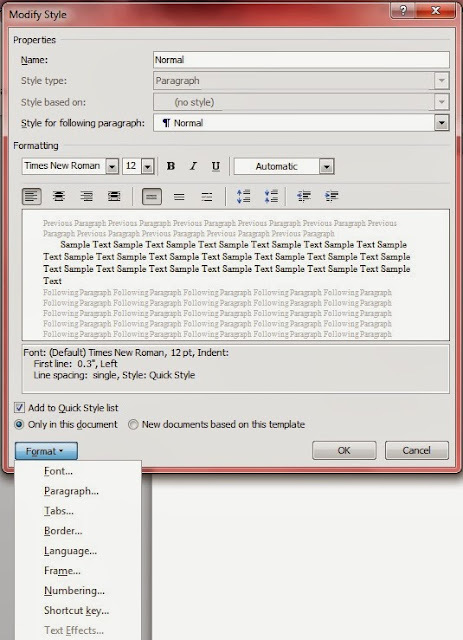 Great tips on creating a style template, Cherie! So sorry to hear about your fall. :( Hope you're on the mend! Cherie, that was a nasty fall. You're lucky nothing was broken. Remember, you heal from the inside out, so take care and give yourself lots of time to recover. Thanks for the formatting info. One of these days, maybe I'll be able to do that. *sighs* Anyway, I signed up, got my toes in the water. (Sorry, but I couldn't read the yellow.) Take care of yourself, girl! Sorry to hear about your fall! I hope you're going to be all right. Crazy how something like that can mess up your life so much. Thanks for these style tips. All this ebook-jargon is starting to make sense to me, but I'm slowly catching on at best. Also, Smashwords is so picky about formatting, isn't it best not to use preset styles for your paragraphs? They insist on using "Normal," don't they? That fall sounds terrible! I hope you feel better soon. OMG, so sorry about your fall. And I'm bookmarking this post to set up a template. Thanks for sharing. This sounds like a great group to be a part of! I had never even heard of the style feature. Thanks for sharing! Interesting. I've never used the styles function, I don't think. Styles are one of the best time saving tips for formatting. It was like a revelation when I found out how to use them! I'll have to tinker... My republished works always look fine, but I could make them fancier. I recently had to set up my default styles again in Word since my hubs updated my computer. Surprise, you have Windows 8 now! Eek!